Alexandre Bissonnette arrives at the courthouse in Quebec City, on Feb. 21, 2017. Alexandre Bissonnette, who massacred six men at a Quebec City mosque in what a judge called an act of “visceral hate” toward Muslim immigrants, was sentenced Friday to life in prison with no chance of parole for 40 years. Mr. Bissonnette, who has been in custody since age 27, will be 67 when he has his first chance at freedom. Quebec Superior Court Justice François Huot called the shooting at the Quebec City Islamic cultural centre a gratuitous act of fanaticism. He said its date − Jan. 29, 2017 − will “forever be written in blood in the history of this city, this province, this country." But he rejected the Crown’s request for six consecutive life sentences without parole, which would have amounted to sentencing the 29-year-old Mr. Bissonnette to a 150-year prison term without parole. The sentence caused anger and consternation among survivors of the attack and leaders of the mosque, who said it didn’t adequately reflect the severity of a crime they called an atrocity. The sentence comes against a backdrop of debate about the extent of Islamophobia in Quebec and as the government promises to restrict religious symbols for some public servants in the province, a measure Muslims feel unfairly targets them. Other victims of the mosque attack spoke of their worry that the children of Mr. Bissonnette’s victims will have to relive his crime when he comes up for parole. 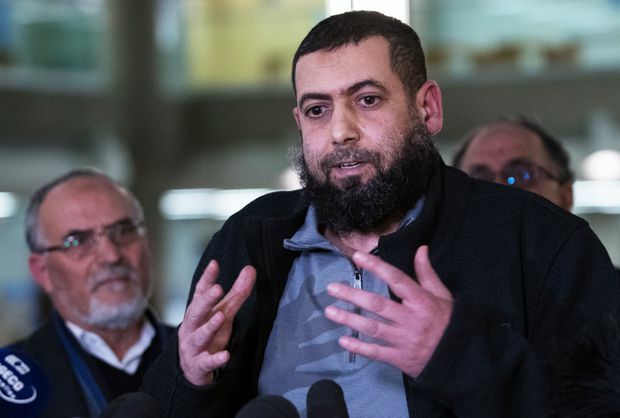 Said El Amari, a victim in the Quebec mosque attack, talks to the press in the Quebec City Courthouse following the sentencing of Alexandre Bissonnette, on Feb. 8, 2019. The sentence was delivered in a courtroom packed with the families of the victims and Muslim community members. The judge repeatedly told Mr. Bissonnette about the pain he had caused and how “hate and racism” has destroyed dozens of lives, including his own and that of his family. The judge took nearly six hours to read his decision. Through it all, Mr. Bissonnette sat in handcuffs facing him in the witness box, a slight figure with a firm gaze and sunken eyes. He wore a white shirt and navy blazer, and turned around occasionally to look at his parents in the front row of the public seating area. The long-awaited sentence comes two years after Mr. Bissonnette gunned down members of a religious minority in an attack that horrified the country and cast a light on homegrown far-right extremism. Changes to the Criminal Code in 2011, brought in under the government of Stephen Harper, allowed Canadian judges to add up 25-year periods of parole ineligibility for multiple murderers. But Justice Huot said that Parliament had gone too far, and declared that the section of the law dealing with consecutive life sentences violated protections in the Charter, including those against cruel and unusual punishment. He rewrote the section to allow him to deliver his 40-year sentence rather than one in blocks of 25 years, as written in the law. He said Canada should avoid the U.S. model of lengthy incarceration and criticized jail sentences exceeding a person’s lifespan. He decided to sentence Mr. Bissonnette to concurrent life sentences for five murders and 15 years for the sixth, with a total of 40 years. 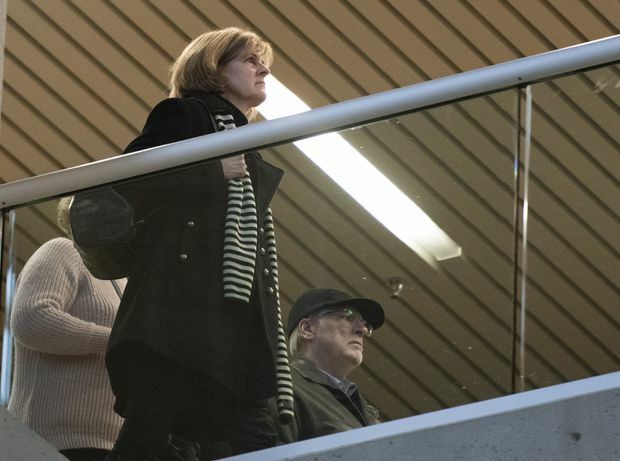 Manon Marchand and Raymond Bissonnette walk out after hearing the judge's sentencing for their son, Alexandre Bissonnette, on Feb. 8, 2019 at the courthouse in Quebec City. Justice Huot cited numerous aggravating factors in sentencing the shooter. He said the attack was “highly premeditated” and targeted a house of worship. Mr. Bissonnette took aim at “vulnerable” people who had gone to pray and had little place to hide, and he shot some of them point blank as they lay wounded on the ground. The presence of four children in the mosque was another aggravating point, the judge said. Three of them fled through a safety exit, running away barefoot in the snow, while one little girl was saved by a worshipper who hid her behind a column. Mr. Bissonnette “directly aimed at children” and “put their lives in danger,” the judge said. He said no sentence would alleviate the families’ loss or bring back the six dead men, whose names he read out one by one. Still, as attenuating factors, the judge said Mr. Bissonnette had no prior criminal record, expressed remorse about his crime and co-operated fully with police. Justice Huot depicted the shooter as an anxious and insecure man who thought a final act of “glory” would lift him out of anonymity. Before rendering his decision, the judge recounted Mr Bissonnette’s shooting rampage in chilling detail, giving a second-by-second tick-tock of slaughter. He described the little girl in a pink tuque who ran amok in the prayer area in panic after the shooting began. He described how Azzeddine Soufiane was shot dead after “heroically” trying to stop the shooter. Sobs could be heard in the courtroom and Mr. Soufiane’s widow, Najat Naanaa, rushed out of the room. The public seats in the Quebec City courtroom were filled to capacity. At one end of the front row sat the children and widows of the six victims. At the other end were the killer’s parents, Raymond Bissonnette and Manon Marchand. Among those also attending was Aymen Derbali, who watched from his wheelchair. He was struck by seven of Mr. Bissonnette’s bullets, one of which rendered him paralyzed. He said he had hoped for a sentence that measured up to the seriousness of the attack, something he felt was not delivered. The Crown said it will study the decision and decide whether to appeal. Editor’s note: (Feb. 11, 2019) An earlier version of this article referred to the 40-year-prison term, when the sentence is life in prison with no chance of parole for 40 years.